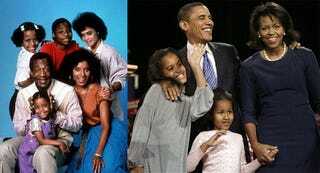 Are The Obamas Possible Because Of The Huxtables? Dr. Alvin F. Poussaint, a psychiatrist at the Jude Baker Children’s Center in Boston and a professor at Harvard Medical School who was a script consultant on The Cosby Show, said in an interview that "there were a lot of young people who were watching that show who are now of voting age." Dr. Poussaint added: "When The Cosby Show first came on, it was a professional, middle-class family. And they said, 'That’s not a black family.' We heard it from blacks and whites. I think that’s why Karl Rove calls it postracial, because it was universal." Bill Cosby himself spoke with the LA Times and says, "For all those people who said they didn't know any black people like the Huxtables — all I can say is, 'Will you watch the show now?'" But doesn't this thinking ignore the fact that there are actual successful black families living in America? They're not all make-believe. In fact, it's pretty insulting not to take them into account. On the other hand, if TV shows do tap into the zeitgeist of this country, what does it say that there are zero black families featured prominently on CBS, NBC, ABC or Fox right now? According to the LA Times, only one series — the CW's Everybody Hates Chris — revolves around a two-parent black family. Maybe having the Obamas in the White House will encourage some diversity on television? Before Obama, There Was Bill Cosby [NY Times] Talking Obamas, Huxtables with Bill Cosby [LA Times] How The Huxtables Paved The Way For The Obamas [Politico] Earlier: How Come All The Pop Culture Moms Are White These Days?